To create this card,I sprayed 2 plain white pieces of A2 cardstock with several colors of Art Anthology Coloration Sprays: Timeless, Valentine, and Grass. After the pieces dried, I stamped the Folk Art background over one, and cut it out an Ornament Die. The die was layered onto a red piece of cardstock, then black. That piece was layered over the second spraed cardstock piece before being adhered to the white card base. 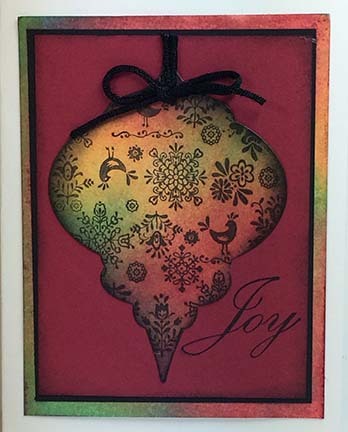 Finally, I added the ribbon and used my stamp positioner to stamp the JOY stamp on the card. I hope you have enjoyed our Christmas inspiration today! Remember, all Technique Junkies Christmas stamps are 20% off through November 13th by using the word Christmas as the coupon code at checkout.